Dear Straws: we are grasping at you. Seriously? You found a way to compare the actions of the Horror of Hogtown to JT? Guess the staffers have checked out the polling on three of the four by elections and have seen that it ain’t looking too good. Public servants who got in trouble for wearing “Stephen Harper Hates Me” buttons to work are fighting back. Several employees at the Canada Revenue Agency who were told to remove the buttons by their managers have filed grievances through their union to fight the order. The buttons were made by members of the Public Service Alliance of Canada (PSAC), the largest union representing federal public servants, and have been circulating around the country. Some workers wore them at May Day rallies to mark International Workers Day and they were available at PSAC’s national convention in Ottawa at the end of April. Robert Campbell, president of the Union of Taxation Employees (UTE), which falls under the PSAC umbrella, said some CRA employees pinned the buttons to their jackets and wore them to and from work in the following weeks. They complied when advised to remove them. Look, folks criticise the government all of the time and I do think that The Robot and his minions don’t particularly “love” the PS. BUT, as long as it is done on your own time and own equipment (at home or over an iPhone, for example), criticism is within the bounds. But government critics who are also in the PS ought to be very careful about the line that is straddled because, like it or not, ultimately, the government is the boss. And one should not criticise them on work time or on work premises. As far as I am concerned, what public servants do outside these parameters is well within their rights, as long as they are not casting aspersions on their own departments. So no, the employer is within their rights to demand that these buttons not be worn on work premises. Just like they have the right to dictate hours and dress codes. Even though I am not a BB user, I do of course feel for the thousands of families who are going to suffer because of the downfall of the once Canadian Golden Boy of the tech world. Shares of Research In Motion Ltd. are plunging in pre-market action this morning in the wake of the company’s brutal first-quarter results and the decision to delay its crucial new BlackBerry 10. RIM stock is down by about 15 per cent in pre-market moves on Nasdaq as the BlackBerry maker’s stunning fall from grace continues amid heated competition from the likes of Apple Inc.’s popular iPhone and devices running Google Inc.’s Android system. But I gotta wonder if this would have happened hadn’t the previous CEO, Jim Basillie, been more concerned with his companies health than with landing an NHL franchise. How about that pony-tailed Senator that Justin Trudeau laid a thumping on? Pretty outta control, I’d say! 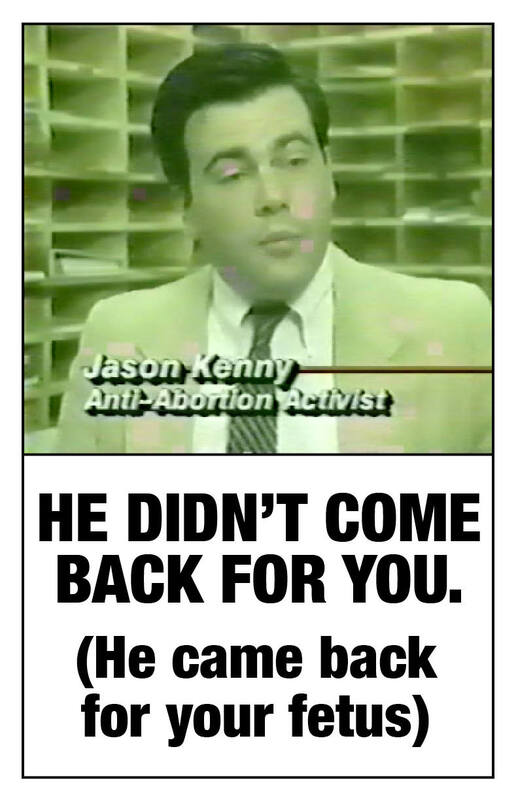 Brazeau wasn’t just missing from the Senate floor. Between June 2011 and April 2012, he also missed 65 per cent of meetings at the aboriginal peoples committee on which he sits. He was away for 31 per cent of the meetings of the human rights committee, where he is deputy chair. The senator, appointed in 2008 by Prime Minister Stephen Harper, sent an email response to a request for comment. “The very simple answer to your question with respect to my attendance or lack thereof is for personal matters,” said Brazeau, former national chief of the Congress of Aboriginal Peoples. Like I said to Dean, Dean, The Cheque Cashing Machine – stay classy, big guy! Hey! Maybe the Cons can use the old Gun Registry for this… just change a few data fields, et voilà! A local MP and police in northwest Toronto are calling for a national stolen cellphone registry to stop an epidemic of thefts in their area and across the city. Mike Sullivan, MP for York South-Weston, says the CRTC must act quickly to create a registry of identification numbers from stolen cellphones and ask providers not to reactivate phones on that list. No one is really surprised, right? That Harper is opening the door leading down a right-to-choose debate corridor? If you are, or if you really think that this is an innocent Private Member Motion to simply discuss updating the “when does life begin” law, then you need to give your head a shake. Of course, the timing of this is to distract Canadians from the F-35, prisons, crime bill, Bev Oda, election fraud, etc. etc. And the motion itself is intended to appease the red meat social cons from the west and in rural Canada. The end game is to take away or limit right-to-choose rights from women. There is no doubt in my mind. Harper micromanages and controls all messaging coming out of the CPC. All of it. This PMM did NOT just sneak though. It has the full support of the PM. Asked in French by a reporter whether he is personally for or against a woman’s right to choose abortion, Harper didn’t answer directly. But of course, campaign promises are a dime a dozen for these guys, eh? … ad hominem attacks were cowardly and used only by those of inferior intellect. And I agree. Yet the CPC doesn’t see it this way. Politics over policy. Attacks over debate. Accusations over cooperation. It’s the Stephen Harper Way. 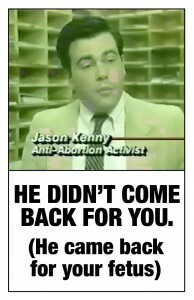 Daniel Veniez penned a good article in iPolitics about the latest series of cowardly attack ads on Bob Rae. Mr. Harper has taken Canada down an ugly path of gradual incrementalist polarization, division, cynicism, and subterfuge. I am deeply embarrassed and ashamed that such an amoral and unethical character could sit in the chair of the most important office in the land. He does not deserve the respect his office commands. Why? Because this sinister attack is only the latest in a very long string of flagrantly debasing drive-by hits, destructive and cynical policy, and immoral conduct by this small man and his smaller coterie of taxpayer-funded cheap shot artists and assassins. This criticism is not aimed at the vast majority of Conservative Party members. They are good and decent people. I know they are horrified with how Stephen Harper has perverted the basic values of the old Reform and Progressive Conservative parties. Robert Stanfield, Joe Clark, Brian Mulroney and Kim Campbell would never sanction – much less stomach – Stephen Harper’s actions and the ugly politics he personifies. My favourite quote : “Stephen Harper is the Todd Bertuzzi of Canadian politics.” Good one! 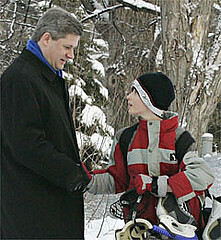 So Harper is acting all smug and tough in Davos, isn’t he? Sigh. I agree with most of that but too bad no one in Davos is calling him on the G8 slush fund, the In and Out scandal, abandoning the environment to oil companies, corporate welfare enhancements, etc., etc. Message to the Cons – the pendulum will swing back one day – and it will smack you right in the forehead! It’s All Star weekend in Ottawa! So why aren’t I smitten? I dunno, but I guess I’m getting more cynical as I get older and see these things more as money-making circuses and less like celebrations of the game. Good to see that the OC Trashpo head, Alain Mercier has backed down from his “you’ll get GPS data when I say you can” stance -,albeit under enormous political pressure from both some Transit Commissioners (thank you Councillor Tierney!) and the public at large. Hens in the backyard? Why not, as long as there are strict controls in place and enforced. I grew up on a hobby farm where we had fresh eggs every day. Nothing like them. There is a movement building in O Town to convince Council into changing the City Bylaw that prohibits the keeping of backyard hens. Keeping hens in an urban setting is not exactly an unusual practice and provides food for a household and education for the little ones. If done properly, there is little noise and no smell. Check out this link to see how a successful urban hen policy can work. I’m not surprised at all… The ol’ Soviet National Anthem rocked… didn’t understand a freakin’ word, of course.